- Reservation for Hotels - Ramada Plaza Jeju, Pacific Hotel, and Honey Crown Hotel, is available at http://www.afnlp.org/IJCNLP05. - Special room rate will be provided to all participants of IJCNLP-05, who are encouraged to make their reservation by September 22, 2005 to get the conference discount rate. Rooms will be assigned on a first-come, first-served basis. The above rates are for a room per night. In case of double occupancy, the same rates are applied as above. All room rates are including service charge (10%) and taxes (10%), but NOT breakfast. A reservation form must be accompanied by one-night deposit to guarantee your room by September 22, 2005. In case of payment by credit card, it will not be charged until your CHECK-OUT. How to Reserve a Room? On-line reservation and the reservation form are available at the official website http://www.afnlp.org/IJCNLP05. Cancellation received on your check-in date & no-show: One night deposit will be charged. Any change or cancellation should be informed via e-mail or fax to Secretariat of IJCNLP-05. Ramada Plaza Jeju Hotel, modeled after a deluxe cruise ship, floats on the waterfront of Jeju Island. This floating hotel, the only one of its kind in Korea, is reached in just five minutes from both Jeju Harbor and Jeju International Airport. Blessed with picturesque landscape and seascape, Ramada Plaza Jeju Hotel transcends its location to become a premier destination for visitors from home and abroad. 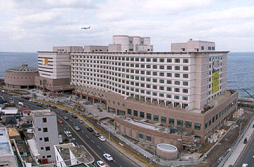 The hotel is located nearby the Jeju Government Office and 3 km away from Jeju International Airport, and easily accessible to various tourist attractions. * Reservation for Pacific Hotel is not available now, thanks. Honey Crown Hotel is the first tourist hotel in Jeju Island to combine pure nature with the city. It is located in old city of Jeju, close to the historic place called �Samseonghyeol�, and is reached in 10 minutes from Jeju International Airport by car.